In May of 2014 I graduated from the University of Colorado Colorado Springs with a dual degree in Visual and Performing Arts and General Communication. Graduating from college is always an exciting and scary time. After the graduation ceremony and summer celebrations faded away, the questions remained: What’s next? Should you continue on to pursue a master’s degree? Should you begin working? Should you take time off to travel? All of these options appealed to me; however, I still wasn’t sure what direction I wanted to head in. Throughout my college career, I aspired to work for an arts-based nonprofit organization. In my final semester of college, I took on a position with Catholic Charities as Communication Intern to expand my knowledge of the non-profit community and learn more about implementing my education in communications. Although I feared that I would not fit in as someone who does not practice the Catholic faith, I found myself right at home amongst the welcoming staff at Catholic Charities. I was excited to participate in the variety of tasks involved in carrying out the St. Patrick’s Day Gala and keeping up with the constant media updates necessary to keep the organization running smoothly. Naturally, when the opening for Communications Coordinator opened, I was eager to apply. Art will always be my passion and my life remains dedicated to my own art practice as well as supporting other artists; however, after learning more about the substantial impact that Catholic Charities has on the community, I felt a calling that my creative skills could be employed to aid in the effort to Provide Help and Create Hope for those in need. I have always been an advocate for collaboration and I see great potential to tie my connections with the art community to this organization that serves those who are less fortunate. After an enduring application and interview process, I felt my heart lift in the air when I was offered the position of Communications Coordinator. Without question, I accepted the position and I am excited to use my knowledge of digital media and experience in event planning to fulfill this role. 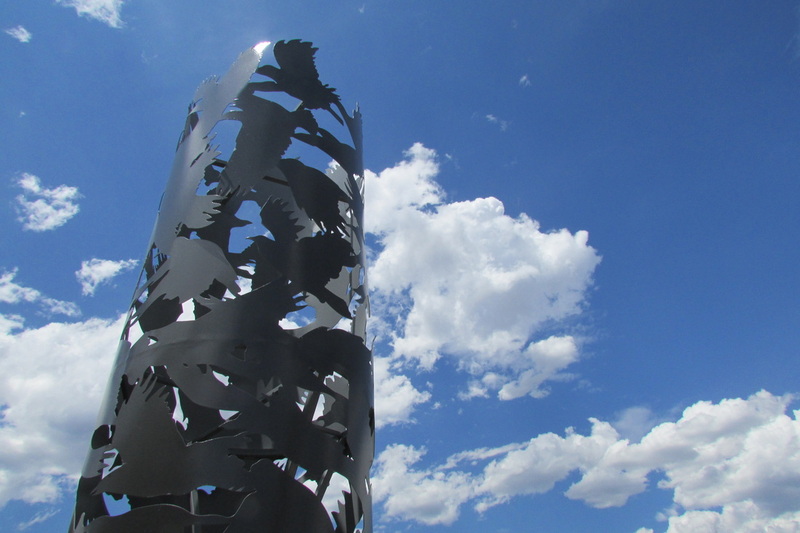 Just a few months before I accepted this position, the installation of my public sculpture, funded by a scholarship at UCCS, took place. 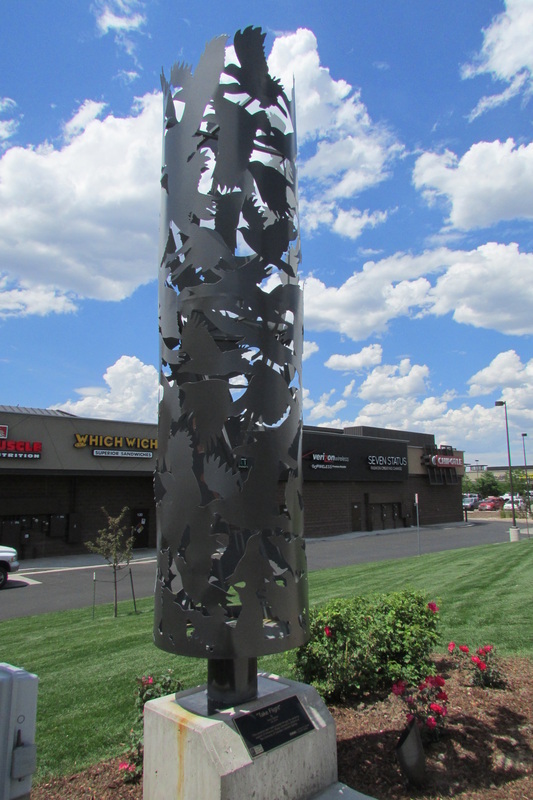 The sculpture is now on view at the University Village Center on Nevada and Garden of the Gods behind Bonefish Grill. As a conceptual artist, my work is driven by the meaning behind the design. 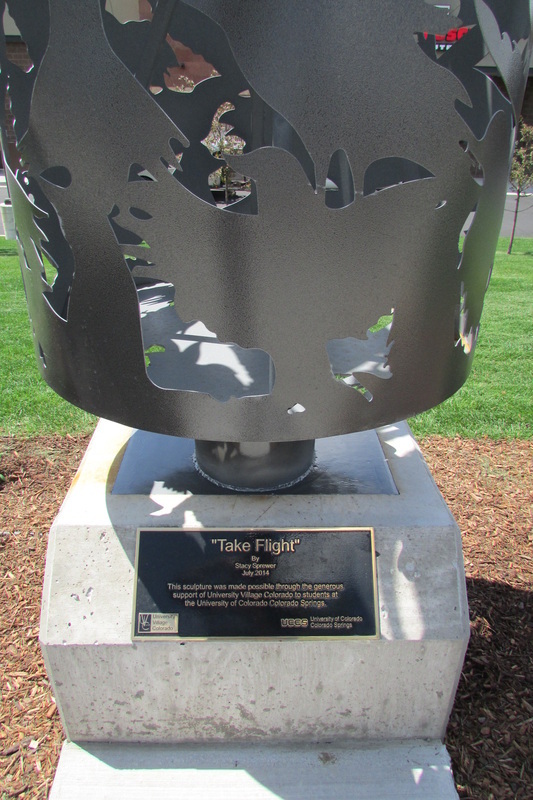 “Take Flight” features a swirl of birds who begin surefooted on the ground and steadily take flight in a continuous flow of energy. As Communications Coordinator, I believe this is my chance to Take Flight in my career and in life! Keep up to date on the work I am doing at Catholic Charities by following us on Twitter https://twitter.com/cathcharcencol and “liking” us on Facebook: https://www.facebook.com/pages/Catholic-Charities-of-Colorado-Springs/. If you are interested in my work as an artist, feel free to visit my website: http://stacymariesprewer.weebly.com. Unaccompanied Minors and the Response of Catholic Ministries: Dispatch from the National Migration Conference in Washington, D.C.